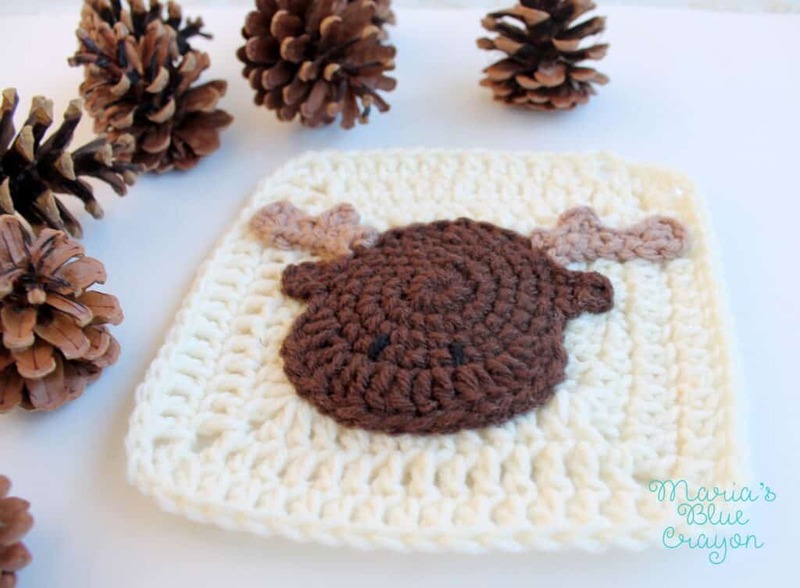 Get the crochet moose applique pattern along with the granny square in an ad-free PDF download here. OR Scroll down for the free written crochet pattern and video tutorial! I am compiling granny squares with adorable little woodland animals to create an afghan! This is the first square of the series that I am sharing with you – A MOOSE! This blanket is going to be radiating with cozy vibes, and I can not wait until it’s all put together. It has been a mild Winter so far here in Central Pennsylvania. I am anticipating colder weather in February, so this blanket will be perfect for snuggles, cuddles, and pure coziness! We have yet to have a mentionable amount of snow, so fingers crossed it will come sooner rather than later so I can put this baby to use! I’ll be ready for you, snow day! 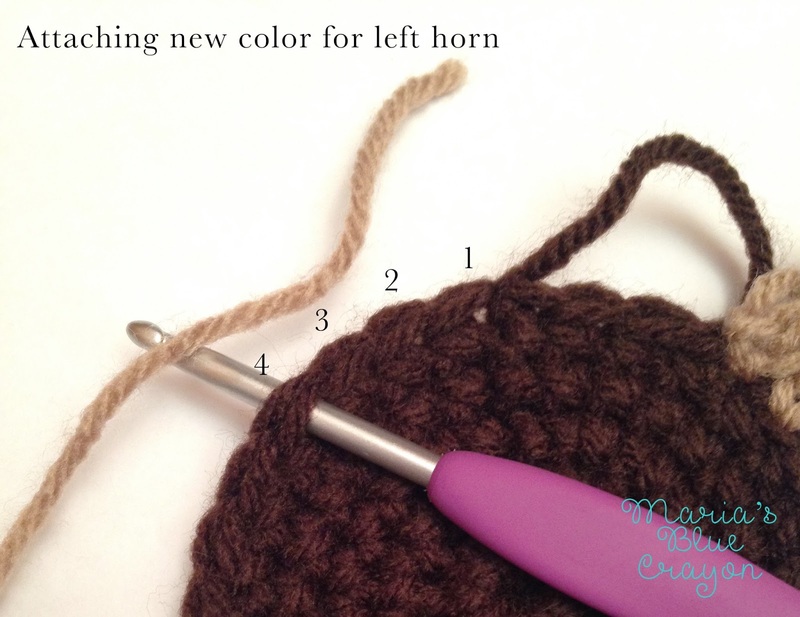 PIN TO YOUR CROCHET BOARD ON PINTERST. 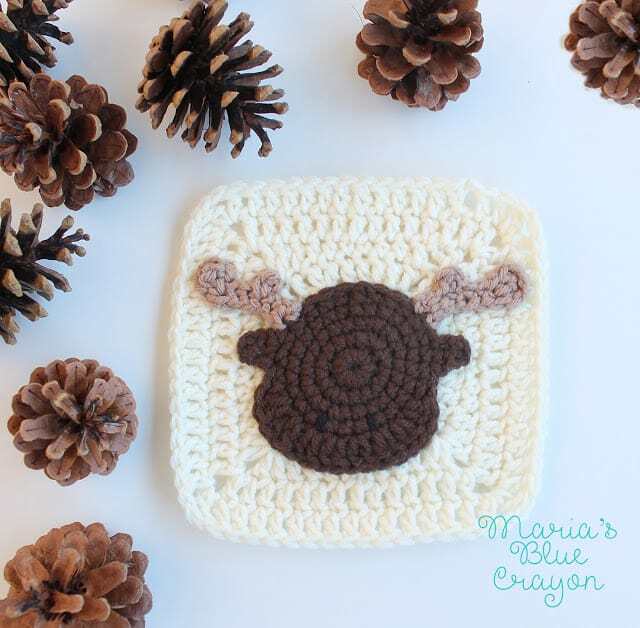 Here’s the pattern for the moose applique, which you will simply sew onto the granny square. We will be working the horns in the 4th and 5th stitches to the right (right horn) and the 4th and 5th stitches to left (left horn) of the space where we joined for the head. Because we are working in the round and from right to left, where we start the left and right horn will be a slightly different. Pay attention to what # stitch you are inserting your hook into. Insert your hook into the 5th space to the right of the join and attach taupe color. Chain 1 to secure, insert and pull up a loop into space to the left (4th space to the right of the join). **YO pull through one, YO pull through both loops. 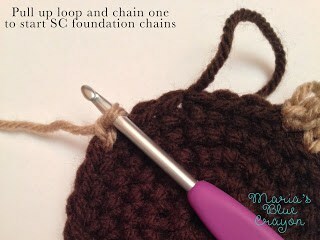 (That completes your first SC foundation) Continue to SC foundation crochet until you have 6 SC foundation crochets. Chain 4, treble crochet into SC foundation nearest to chain. Slip stitch into same space. Slip stitch into next two spaces. [Slip stitch, chain 2, DC, Slip stitch] all into next space. Slip stitch until you get back to the head portion. Slip stitch into 4th space to the right of the join on the head portion. Fasten off and leave tail for sewing onto granny square. 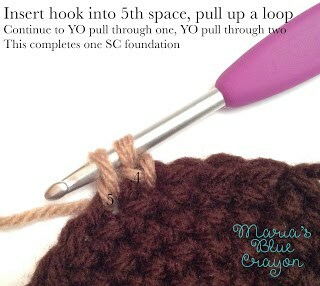 Insert hook into 4th space to the left of the join, attach taupe color. Chain 1 to secure, insert and pull up a loop into the space to the left (5th space to the right of the join). Follow direction from ** for the right horn. Attach chocolate brown one space below the horn, SC into same space and next space. Love this! I have a friend who owns a little cabin in the woods. This wlll be perfect! Thank you for sharing. I love this pattern! I am excited to learn it! I am just a little confused, when it says "3sc, 2sc in the next 3 spaces" does it mean 5 sc in each? Sorry for the confusion! I think you are referring to Row 2? Correct me if I'm wrong. So basically, you will single crochet for 3 stitches and then for the next 3 stitches you will have 2 single crochets in them each. I found a video that explained foundation chains and that helped. And I did the left antler by turning my work and working from behind. Both came out good. Plus I made this much smaller as I'm putting it on a hat.